Last May, cellist Deborah Pae and pianist Misha Namirovsky enthralled audiences on their recital tour in Antwerp, Brussels, and Waterloo including an international livestream from the Chapelle Musicale Reine Elisabeth in partnership with Musiq3 Radio and WASH Productions. After nearly a year, they are returning to Brussels under the auspices of MGConcerts and Domusica to present two recitals featuring works by Schumann, Beethoven, de Falla, Lecuona, Cervantes, and Brahms. Do not miss this dynamic duo on May 1 and 3, 2017. It is with great excitement that Marilyn Gilbert Artist Management (MGAM) welcomes cellist Deborah Pae to its roster of wonderful artists. MGAM will represent Ms. Pae in Canada and the United States. Highlights of Ms. Pae's 2016-2017 season include concerts at Carnegie Hall's Weill Recital Hall, the Isabella Steward Gardner Museum in Boston, the Smithsonian National Museum in D.C., Philadelphia Chamber Music Society, Chamber Music Columbus, Rice University's Duncan Recital Hall, and the Signature Series at the Stocker Arts Center. In partnership with Outhere Music Label, Musiq3 Radio, and the Chapelle Musicale Reine Elisabeth; the release of her live recital recording on Series Prestige, which includes works by Britten, Schubert, and Beethoven; will also take place this year. Debuting at sixteen with the New Jersey Symphony Orchestra, Korean-American Pae has since played concertos with Sinfonia Varsovia of Poland, Orchestre Philharmonique Royal de Liège, Ensemble Orchestral de Bruxelles, Orchestre Royal de Chambre de Wallonie, and the Westchester Philharmonic under the batons of Vassily Sinaisky, Thomas Wilkins, Christian Arming, Augustin Dumay, and Itzhak Perlman. Ms. Pae has also played solo recitals at the Neue Galerie, the Metropolitan Museum of Art, the Van Wezel Foundation’s Young Artists Series, and in 2005 debuted in Europe at the Musée du Louvre and has since been invited to perform at Palais des Beaux-Arts, Flagey Radio Hall, and Musée de Grenoble. Many of her performances have been broadcast internationally on television and radio, most notably the 2003 Grammy Awards and the 75th Anniversary of the Chapelle Musicale Reine Elisabeth. A devoted chamber musician, Ms. Pae is the cellist of the critically acclaimed Formosa Quartet (winners of the First Prize and Amadeus Prize at the 2006 International London Quartet Competition) and founder of Trio Modetre (winners of the 2016 Tarisio Trust Young Artist Grant and Silver Medal at the 2012 Fischoff National Chamber Music Competition). She has been a featured artist at festivals including Marlboro, Ravinia, Crans-Montana Classics, Festival Les Musicales de Colmar, and the Amsterdam Cello Biennale. Ms. Pae has shared the stage with artists including Itzhak Perlman, Pamela Frank, Charles Neidich, and members of the Guarneri, Juilliard, Mendelssohn, Johannes, Pro Arte, Takács, and Cleveland String Quartets. Ms. Pae enjoys performing new and seldom-played works. Her debut recording released in 2013 by Zig-Zag Territoires, features Saint-Saëns’ Cello Concerto No. 2 in D minor with conductor Christian Arming and the Liège Royal Philharmonique. In 2017, Trio Modetre’s debut recording Tribute to Frank Bridge: Masterpieces Among Peers will celebrate the 75th anniversary of Bridge’s death and revive his second piano trio. Furthermore, the American composer Jeffrey Mumford is currently writing a concerto of radiances blossoming in expanding air, which will be premiered by Ms. Pae in London with the English Symphony Orchestra (ESO) in 2018. Pae has also given world premieres of Fantasia Festa by Jonathan Crehan, Le Dormeur du Val by Roberto Kalb, and Song Recollections by Lei Liang. Ms. Pae is newly appointed Professor of Cello at Eastern Michigan University. She has served as Professor of Cello and Chamber Music at Académie et École Anglicorde in France, Visiting Guest Artist at Columbia University’s Music Performance Program, and Chamber Music Mentor at the Juilliard Pre-College Division, New England Conservatory Preparatory School, and Kneisel Hall Chamber Music Festival. She has also served as artistic manager of Music for Food Boston benefit concert series, and founder and curator of the WLP Lunchtime Series in Boston (2010-2012). Beginning at four on a bricolage cello made of a Cheerios box wound with strings, three years later, Ms. Pae became the youngest cellist accepted into the Juilliard Pre-College Division. She is an alum of the Juilliard School and the New England Conservatory, and Associated Artist at the Chapelle Musicale Reine Elisabeth in Belgium. Her mentors include cellists Gary Hoffman, Laurence Lesser, and Joel Krosnick as well as violinists Miriam Fried and Sylvia Rosenberg, and violist Kim Kashkashian. Recognized for her artistic versatility, Ms. Pae has received major awards from the Frank Huntington Beebe Fund, Belgian American Educational Foundation, DoMusica Foundation, and National Foundation for Advancement in the Arts. Ms. Pae plays a Vincenzo Postiglione cello (c. 1885) generously on loan from the Arts and Letters Foundation. Marilyn Gilbert Artists Management (MGAM) has embraced change with a roster of musicians whose work challenges the artificial boundaries of genre and whose sparkling musicianship gives them broad appeal. We are committed to developing the careers of dynamic, innovative musicians. The music market is undergoing a massive shift, as audiences are increasingly comprised of new communities with new tastes. In this context, musical innovation and adaptation is not only an aesthetic, but also a necessity. We are proud to represent artists who speak to a multitude of audiences, in a multitude of ways. Audience development is a constant process. For this reason, we partner with artists who reach beyond the stage and make a difference in people’s lives, and work closely with both artists and presenters to develop programmes that transcend the concert hall and embrace the educational and outreach opportunities required to foster an active music culture. We are so excited to have been chosen as one of Tarisio Trust's top four winners! With this Young Artist Grant, we will be recording and releasing Trio Modetre's debut recording Tribute to Frank Bridge: Masterpieces Among Peers with TYXart Label. This will mark the 75th anniversary of Frank Bridge's death and revive his second piano trio - only two recordings currently exist! We will pair the British masterwork with another incredible masterpiece of the piano trio repertoire, Brahms Trio No. 1 in B major. Thank you to Tarisio and jury members Lisa Batiashvili, Jeremy Geffen, and Gautier Capuçon for believing in our project. We look forward to sharing it with you in 2017! I've been away for a year and have finally returned to my European home, Brussels, for a series of recitals! My recital tour begins this Thursday in Antwerp at OPUS4 Gallery. I am extremely excited for audiences to hear me with my wonderful pianist, duo and trio partner, Misha Namirovsky. If you are in Antwerp or nearby, please join us! We'll be playing the same program in Brussels (May 29 at 7:30PM, for more info check out the concert pages) and at the Queen Elisabeth Music Chapelle (May 30 at 8:00PM), which will be broadcast Live Stream on YouTube and on MUSIQ3 Radio. Technology is making the world a smaller and more wonderful place so please tune in. I will have all the info below! WATCH THE LIVE STREAMING HERE (BRUSSELS TIME, GMT+2)! It seems like March flew by in a flash and now we are already at the end of April! I have been on 8 flights and 7 concerts in the last four weeks, and will be on a plane to Paris this Wednesday. There is so much I want to share with you and will get to in the coming week. But in the meantime, I wanted to share this honor and highlight! The members of the Formosa Quartet have been a joy to perform, travel, and spend time with during the last few weeks. I am thrilled to be part of their global family and to join them in this new chapter of their 14-year history. The official press release is below. To learn more about the Formosas, please go to the Formosa Quartet website where you can watch our performances, attend our concerts, much more. It is with great pleasure that the Formosa Quartet announces its new member, cellist Deborah Pae. An internationally acclaimed artist, Deborah has built a rich and varied career as a soloist, chamber musician, recording artist, teacher, and pioneer of new music. Her numerous awards include grants from the Frank Huntington Beebe Fund, DoMusica Foundation, and National Foundation for Advancement in the Arts, as well as the silver medal in the Fischoff Chamber Music Competition with Trio Modetre, the ensemble she co-founded. She has been a featured artist at renowned festivals including Marlboro, Ravinia, Crans-Montana Classics, and Open Chamber Music at Prussia Cove. After three years as Artist-in-Residence at the Chapelle Musicale Reine Elisabeth in Belgium, Deborah has recently returned to the United States where she continues a full concert season of solo recitals and chamber music appearances in Europe, Asia, and North America. Hailed by Gramophone as "exceptionally gifted" and "breathtaking", Deborah has shared the stage with many of the world's celebrated artists including Itzhak Perlman, Miriam Fried, Pamela Frank, and Kim Kashkashian, and members of the Guarneri, Juilliard, and Cleveland Quartets. The Formosa Quartet is thrilled to welcome both Deborah and her Vincenzo Postiglione (c. 1885) cello, generously on loan from the Arts and Letters Foundation, and looks forward to an exciting musical future in its new formation. Deborah begins playing as a part of Formosa immediately commencing with a 4-day residency at UCSD from April 18-21, 2016, during which Formosa will record Lei Liang's Verge Quartet as well as perform Liang's Song Recollections, a piece based on aboriginal Taiwanese folk songs — whose premiere, presented by Art of Élan in San Diego, was recently given by Formosa with Deborah as cellist. This June Deborah will make her inaugural trip to Taiwan with Formosa to premiere a commission by New-Zealand composer Garreth Farr for harp and string quartet. Deborah succeeds cellist and founding member Ru-Pei Yeh, who remains in the Formosa Quartet family and whose warmth, humor, and artistry will be much missed by Formosa's audiences. Formosa extends its heartfelt thanks to Ru-Pei and celebrates her artistic contribution with its new CD on the Delos label (released April 6, 2016), featuring Brahms and Gernsheim piano quintets with pianist Reiko Uchida. On Monday February 22, I was thrilled to return to Boston with my piano trio, Trio Modetre, with violinist Tessa Lark and pianist Misha Namirovsky. 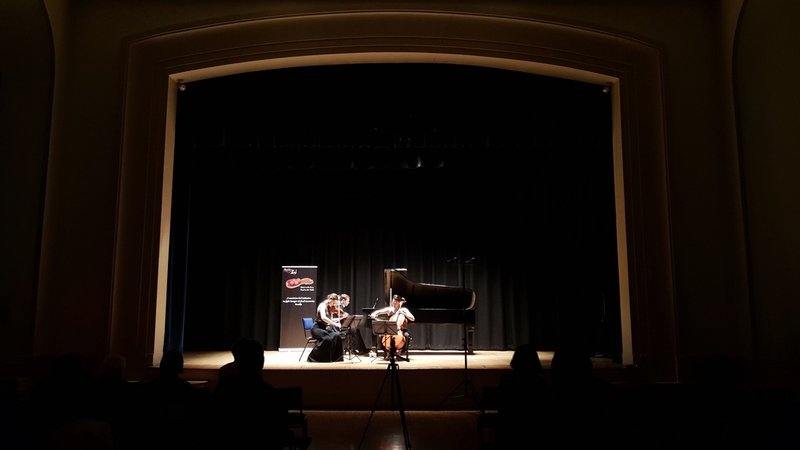 After several years of living on different continents, traveling and performing across the globe, we finally made our much anticipated return at the invitation of Music for Food Boston (MFF) at the New England Conservatory, our alma mater. Performing in Boston seemed very fitting as the trio was founded at NEC in 2012 where we were all students and we got to share the stage with wonderful violinist and NEC faculty, Soovin Kim, who gave a powerful performance of Bach's Solo Sonata in D minor, BWV 1004. Our concert that evening served as a vehicle to raise awareness and support for the Women's Lunch Place, one of MFF's affiliate partners and a sanctuary for women experiencing homelessness or poverty in the Boston community. This shelter holds a special place in my heart as I curated a concert series there in 2011. The series is still flourishing today under the leadership of current students at the Conservatory. For those of you who are just hearing about Music for Food, MFF is a musician-led initiative to raise awareness about local hunger relief. The concert series brings artists, musicians, audiences, and the people of our communities together to contribute their talents and gifts towards a very important issue in our society. MFF began in 2010 and through their grassroots movement, they have flourished nationally and internationally. Their model is sustainable and can be replicated for musicians to bring to their own communities which is why you can find Music for Food in Boston, Appleton, Chicago, Cincinnati, Cleveland, Dallas, Los Angeles, New York, Philadelphia, Washington D.C., and Berlin! If you haven't heard about their growing partnerships, please visit their website to find out more. Even if you're not a musician, you can still be part of this incredible organization. Thanks to a wonderful friend, SoYoung Sarah Yang, who has some nifty skills capturing photos on her phone, we're able to share a bit of the evening with you here. Additionally, we would like to thank Kim Kashkashian, violist and artistic director of Music for Food; Cashman Kerr Prince, general manager; their entire team, and the Boston community for welcoming us so warmly. It's not every day that I attend someone else's concert and find a life-size photo of me at the entrance of the hall. These photos are from December 2014 at the 'Beethoven Festival' at Flagey Radio Hall in Brussels. Made for a great laugh! Today's #ThrowbackThursday is from June 17, 2015 when I had the honor of being a cultural ambassador to the United States and performed at the Belgian residence of the U.S. Ambassador to the European Union, Anthony L. Gardner. There are not many occasions when musicians and artists come in contact with the world's most influential leaders, but that evening, my entire audience was made of up members of the EU Commission, European Parliament, and EU Council. I was very humbled to be in their presence and as an American artist, thrilled to have performed and offered music as my contribution to their Mission to the European Union! Who says you can't go to the beach in the dead of winter? Because I am! And I wouldn't have it any other way...even if it's a deadly 6-10 degrees (F). I'm on the last leg of my trip in the States before heading back to Brussels and I'm excited to return to my old stomping grounds at the Perlman Music Program (PMP) on Shelter Island this Saturday, February 7 for a romantic program of Miaskovsky, Barber, and Brahms. It is a magical place and since the Shelter Island Reporter says it will be 'Sweet Music for Winter Afternoons' in their preview, I hope to swoon you all with some sweet slides and melodies. If you are nearby, please do come! NOTE: This concert starts at 5:00PM!